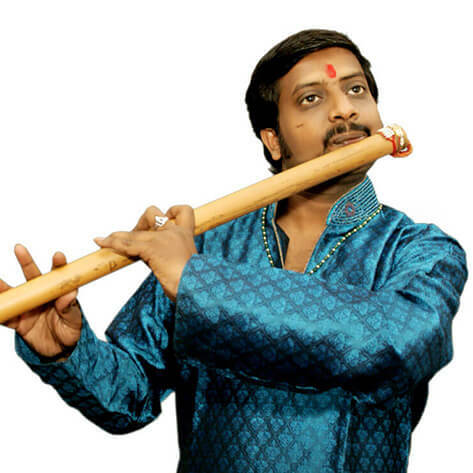 Atul Shankar is a flautist who received his training under his grandfathers, late. Pt Bhola Nath Prasanna and late Pt Khelvan ji, renowned exponents of Benaras Gharana. Currently, he is training under his dada guru Pt Shyam lalji for Shehnai. He is also honing his skills under his uncle Shri Ajay Prasanna. Not content with just practical experience, Atul is pursuing his doctoral programme under Dr. Prahalad Nath. He is also training for vocals under his mother Smt Rita Shankar. He has performed at many places in India and abroad and has received several awards. His major performances include Durga Ma and Ganga Festival Varanasi, Sankatmochan Festival and Yuva Mahotsav by Sangeet Natak Akademi.